YOU MUST FOLLOW THESE INSTRUCTIONS FOR YOUR GIFT -Please accept my advance apologies that it's somewhat futzy but we are not in the business of free products and so have no need of spending a lot of money on a really cool free ebook delivery system. We are, however, big fans of The Old Schoolhouse Magazine! We get all tingly inside whenever we can help home school folks add sewing education to their day. Here are the two ebooks we are including in the Birthday Bash Gift Bag for readers of The Old Schoolhouse Magazine. You will need the Coupon Code given to you in your Gift Bag to offset the $9.98 cost of the ebooks back to ZERO. You may also add other items to your order without affecting the free gift as long as you use the coupon code. The coupon can only be used for these two ebooks. To claim your free gift, you will put each ebook you want into your shopping cart separately, then checkout with your coupon code. You can see the full description of these two ebooks at their product page. When you get to the product page, use the "add to cart" button ON THAT PAGE to add each ebook separately to your cart. You can choose either ebook, or both ebooks as your Birthday Bash Gift. Both these items can be found in our category "Add On Accessories". The free gift coupon will work whether you start here or there as long as you use the individual product page to add them to your cart. Thank you for supporting Home Schooling and taking good care of your kids and their education, your way! 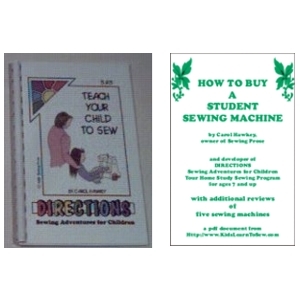 These two ebooks will get you off to a great start of adding a sewing curriculum (I do hope you choose DIRECTIONS-ShowMeSew) to your homeschool lessons.